Devising ways to prevent Veteran suicides is front and center on the minds of VA officials. An average of 20 Veterans a day are taking their own lives, a rate that has been holding steady in recent years. Studies have shown that former service members are more likely than non-Veterans to commit suicide. One of VA’s prevention efforts is an outreach program aimed at predicting who may be at highest risk for suicide and intervening before a suicide occurs. The program is REACH VET, or Recovery Engagement and Coordination for Health – Veterans Enhanced Treatment. It uses predictive modeling and medical record data to identify Veterans at highest risk for suicide. The model includes such variables as demographics, use of VA services, and medications. Once a Veteran is identified, his or her VA mental health specialist or clinician checks on the Veteran’s well-being and reviews that a person’s treatment plan to determine if enhanced care is needed. 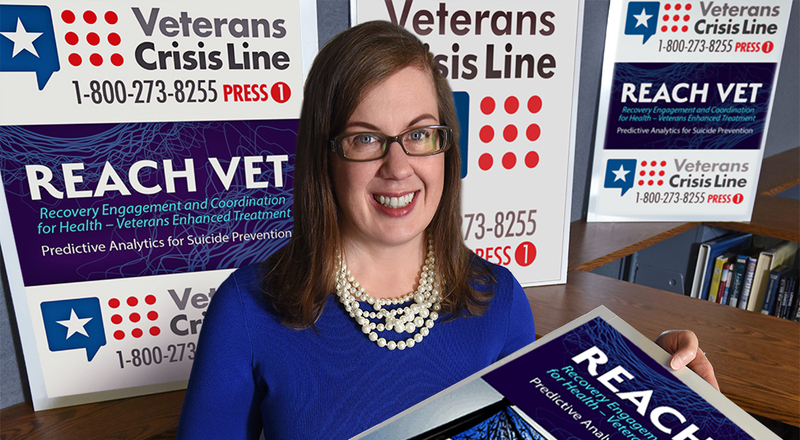 Dr. Sara Landes, a clinical psychologist at the Central Arkansas Veterans Healthcare System, (pictured above) is leading a study to examine the implementation of REACH VET. The program, launched in April 2017, is now in use at all VA medical centers. It’s run by VA’s Office of Mental Health and Suicide Prevention (OMHSP). Landes is focusing on the implementation of REACH VET at 28 VA sites. She says preliminary findings about the impact of REACH VET on Veteran outcomes are “promising but not definitive.” In its first year, the program identified 30,000 Veterans who are at risk for suicide. REACH VET is producing information that will inform VA facilities of their patients who are in the top 0.1 percent tier of suicide risk. Early results show the program is having a positive impact on Veterans: more health and mental health care appointments; declines in missed appointments; fewer inpatient mental health admissions; and lower all-cause mortality. I still wake up everyday reliving experience. In town hall meeting Jan 9, 2018 I asked director and staff why? I’ve tried everything absolutely amazing the GASLIGHTING going on . And you wonder why veterans commit suicide? That said use you patient list? I am curious if there is a number or estimated number of veterans that will not report or seek help due to the recent attacks on rights, or the fear of losing 2nd amendment rights, just because they may be having some issues or difficulties? I know for a fact for some going target shooting is a form of therapy, but will not go to the VA or any mental health professional for fear of being labeled as defective. What makes it worse is that every doctor, hospital & social security all tell me I have to wait until I’m 65 yrs. old before I receive any healthcare, disability or social security when I can’t work & have no income. Lawyers are all sick minded & always go to the highest bidder. I’m 50 yrs. old, have served overseas for more than 5 yrs. Honorably. I have 8 herniated discs & never got any healthcare until President Trump took Office because the country is broke has been the excuse for more than 20 yrs. I have only got 1 disc replaced. Not anyone has ever got fired at my OH V.A. & I let President Trump know though letters, emails & the hotline. The suicide prevention is total horse manure & they never did anything for me when I’m in crucifying pain. I totally agrees the V.A. should no longer be funded & should be shutdown. service is getting better. Inpatient psych at VA in West Haven Ct and Psych emergency room is good. social work program for MICHM program good too. I have BPD which gets a lot of ‘eye rolls’, but maybe I am imagining…overall ok services. Va should not be funded. Give me medicare at no cost and no co pay scrip to make up for the no turn back damage va has caused. Would like to sue for gross mafesence and mal practice and deriliction of duty. this surprised me-I have never heard of it. Albuquerque, N.M., WAS my primary V.A. hospital. I live in Deming, N.M. 14 years and no psychiatrist, zip, nada, nothing. I have been gone almost a MONTH. I ended up in a locked facility in Albuquerque. Across from the V.A. hospital!!!!! I was diagnosed, treated good and they got me off the V.A. morphine dragon. I have never come so close to ending my own life, after the FRUSTRATION of calling, every V.A. hotline I could. I would love to have more information about this-I never want to slip thru the cracks like that again. Thanks for this Michael, it has been found that knowing vets are at risk is the first step towards preventing these suicides. THE SUREST WAY IS TO APPROVE (AS SOON AS POSSIBLE) THE MEDICALLY SUPPORTED CLAIMS AS SOON AS POSSIBLE..